iSpyConnect lets you remotely configure pretty much all settings of your cameras remotely (except for the schedule which is read-only). 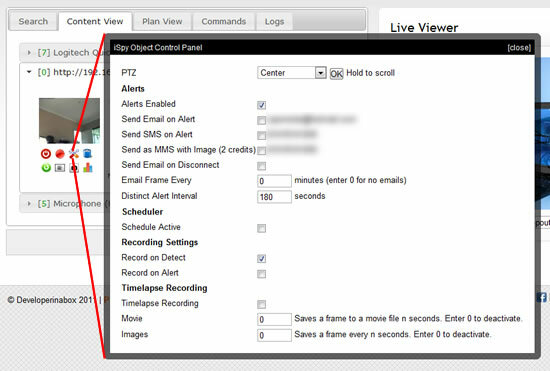 Click on the spanner icon below a camera or microphone thumbnail to open the control panel for that object. Important: These controls are live controls - there is no save button on the panel, as soon as you check a checkbox or modify an entry that setting is updated in iSpy. If you are away from home or work and you are getting alerts you can switch them off here by opening the control panel and unchecking the "Alerts Enabled" checkbox. iSpyConnect supports the full range of PTZ controls that iSpy does. The PTZ control is only displayed if your camera supports PTZ (and you have selected the PTZ control in camera settings). To execute a PTZ command select it from the drop-down on the control panel and click OK. To Pan in a direction hold the OK button down.